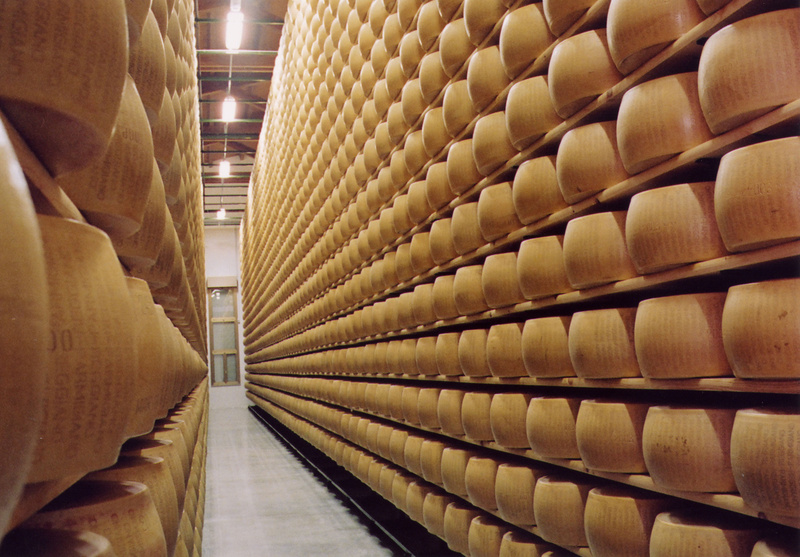 Enjoy an interesting tour to a Parmigiano Reggiano cheese dairy. It will last more or less 1 hour and will end with a tasting The tour will be in English, provided by the dairy staff. Please note that cheese dairies are in the countryside and this price doesn't include transportation. If you don't have a car please contact us and we'll send you an offer. When we'll get your booking we will check availability and let you know which dairy will welcome you and at what time (normally tours start 8.30/930). This is not a private tour, you may share it with other travelers. If you have any doubt and you prefer to contact us before going on with the booking just give us a call! Parmigiano-Reggiano is produced exclusively in the provinces of Parma, Reggio Emilia, Modena and parts of the provinces of Mantua and Bologna, on the plains, hills and mountains enclosed between the rivers Po and Reno. The cheese makers are the custodians and interpreters of the secrets of the true craft of milk processing, the result of their work is inextricably linked to their personal experience, giving an appreciable diversity of taste and aromas. The minimum maturation time for a cheese wheel is twelve months, and it is then inspected for quality. A system of coloured seals helps the consumer identify the level of maturation. A red seal identifies the Parmigiano-Reggiano which has been matured for over 18 months. This product has a rather strong milk flavour, with aromatic notes such as herbs, flowers and fruits, which make it ideal for snacks and aperitifs. A silver seal identifies cheese which has been matured for over 22 months, with decidedly stronger aromas. Finally, a gold seal identifies a cheese which has been matured for over 30 months and has the most distinctive flavour and complex aromas, with a higher nutritional element concentrated over its long maturation. Price per person including tour and tasting.